Yesterday morning the heavens opened up, angels sang glorious tunes and the Pennsylvania Department of Agriculture handed me my Commercial Kitchen Certification. I have been working really hard to get all of my ducks in a row this year. We have had 3 visits from the PA dept of Ag, and 2 from the USDA this year. We have been certified as a commercial Kitchen, approved as a farm producer to accepts Farmer’s Market Nutrition vouchers from seniors, mothers and children, we have been approved to accept snap benefits from low income families. Whew! Did I mention that I greatly underestimated how much time it takes to cube all of that lamb? I am not a person that relies on excuses to get by in life, but the last 2 weeks have been a real blur to me. I may have messed up some bags, I know I didn’t get my blog out on time, but really, I am so glad that I have finally reached my goals so I can focus better on our CSA’s. In my original plan, many of these things were to be done before our picking started, but our government just doesn’t operate like that. Se la vie! The nights have been cold. Our tomatoes didn’t do what they told me they would do this week, so many are still on the plants waiting for that perfect color. I am trying to substitute other items. I personally have had enough of the squash, but it’s doing so well and refuses to quit! I’ll leave you with a recipe this week and look forward to Sunday’s blog to get back on track. 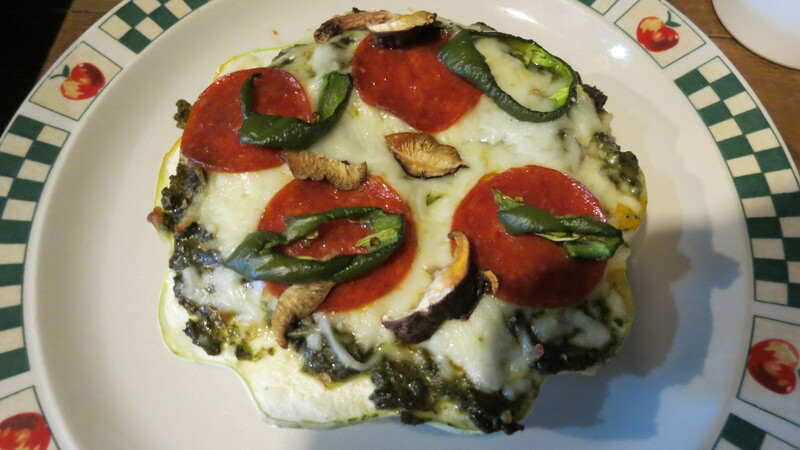 The wonderful shape of these squash lend to a Pizza that contains no gluten and low carbs. Slice the patty pan squash through the center. Sometimes I slice the stem end so the squash sits flat on the pan. Add your favorite pizza toppings, I used pesto from the basil in our CSA’s this week, but regular pizza sauce works well too. Bake at 350 degrees for 20-25 minutes. while I am ready to see some tomatoes (especially those smallish yellow ones: YUM!) I LOVE patty pan squash so keep it comin’! Looking forward to the lamb! Congratulations on your commercial kitchen license! I know you work hard and appreciate it! I used the spaghetti squash with pesto for lunch today and it was delicious! I wondered when I saw lamb cubes I was wondering, what the hack is Dawn doing. You crazy girl, congrats. BTW, sugar snap tomato plants have mutated into 7′ tall plants and buckets of the sweetest fruit! Thanks for selling me those plants gotta get some more next year! I enjoy surprising you all with extra special goodies:) It all takes time to put together, but it’s definitely worth it!